This sprawling metropolis has proven to be a land of intense sights, smells, and sounds rolled into a diverse melange of stimuli that smack you in the face from the moment you wake up to the moment you drift off to sleep. The following are some observations and tips gathered along the way thus far. 1. Bring a book to ease the pain of the nearly 24-7 traffic jams on the main streets. 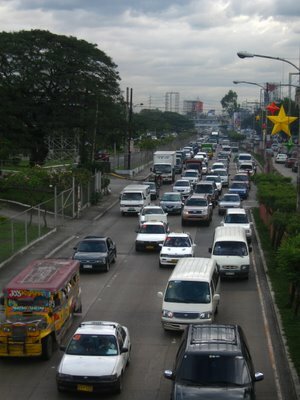 Rush hour is from 6AM to 10AM and 5PM to 10PM. During this time traveling less than 2 miles can take more than two 2 hours! If traveling anywhere on the the weekend (Fri-Sat), plan to leave VERY early to account for traffic. 2. 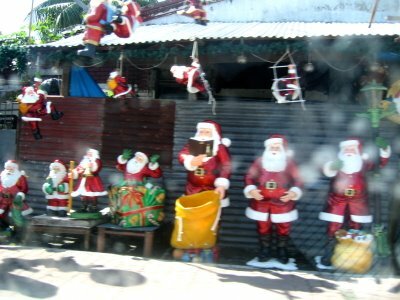 Churches are omnipresent in the Philippines. You can find a morning mass on every block, in every neighborhood, and even at malls. During Christmas week mass is held every morning at 4 AM. Expect to get multiple invitations from friends to family to missionaries (I met some at my gym) to attend. 3. Erase your concept of personal space. Riding the train during rush hour involves nearly riding on the passengers next to you- be prepared to become intimately familiar with your neighbor's cologne/perfume or lack thereof. 4. In the Philippines, texting is king (and cheap). Phone calls are an expensive rarity- machine gun fingers and juggling multiple texting convos will prove essential in maintaining both business and personal relationships. Also cell phones are the norm, landlines the exception. 5. Don't use your cell phone on the street or leave it out, say on your table at a restaurant- again to avoid snatchings. This goes for any object of value, expose in public at your own risk! I met an international student from France who has been here for a year and had his wallet stolen a grand total of 3 times, call it a seasonal trend. 6. 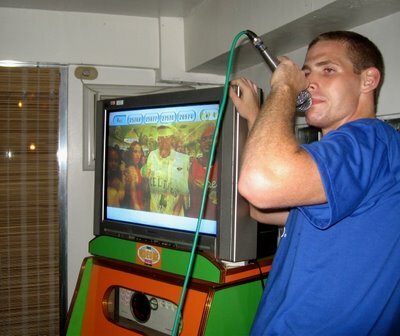 When attending a social event, be prepared to sing karaoke- basically a requirement of any get together. From the Beatles to 50 Cent to Apo, the list of available tunes can range well into the hundreds. A healthy dose of San Miguel, the local brew, and a willingness to make a fool of yourself prove useful allies in hitting those high notes. 7. Like fried chicken? You're in the right place. From the local Jollibee to KFC, McDonald's, Shakey's, and the multitude of other fast food joints you will never be far from the standard fried chicken, rice, and gravy combo for $1.75 USD. Family-size buckets will run you about $6 USD. 8. During the holiday season be prepared for the incessant, inescapable Christmas songs blaring from every device capable of producing audio. From taxi radios to train music to mall music to television to cell phones to choirs, when it is all said and done you will be intimately be familiar with The 12 Days of Christmas and even the Filipino Christmas remix to Gasolina. 9. In this basketball-obsessed country, don't expect to find much besides NBA highlights and local team stats on ESPN. Also pay-per-view doesn't exist so any major boxing match will be televised (you can eat breakfast while watching a match when they air on Sunday morning). Big fights, i.e. anything involving Manny Pacquiao, are shown at movie theaters! 10. 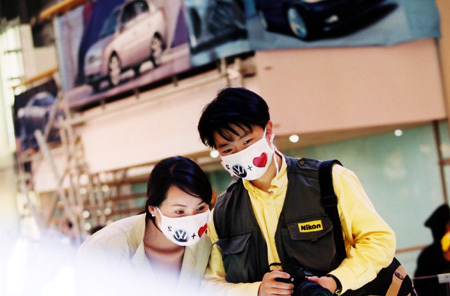 Sewage, massive landfills, thick car exhaust, and a tropical heat that intensifies all olfactory stimuli make a strong argument for SARS-grade face masks when strolling about town. 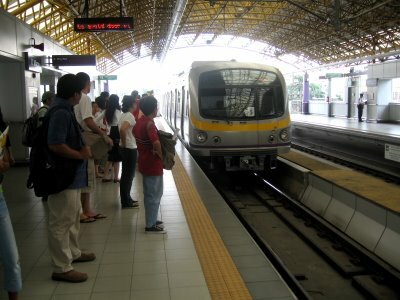 Note: Manila is ultimately a city with many hidden gems, undiscovered nooks and crannies, and truly friendly Filipinos. Although plagued by pervasive poverty, hence all the snatchings and pick pockets, the city has many charms which will be covered in future posts.